Here I’m going to show you three really good ways to improve your swing tempo or rhythm during your movement on your golf swing. So what we are looking for here is to make a really consistent movement. It doesn’t matter if it’s particularly fast or particularly slow, what’s important is that it’s consistently that way. What you don’t want to do is mix a really slow take away with a very quick accelerating down swing. And similarly you don’t want a quick movement on the backswing mixed in with a very slow lethargic movement on the down swing. So it doesn’t matter whether it’s slow or fast, the key to it is to be consistent. In order to be consistent the first tip that I would give you is to count to yourself as you are swinging. Now what we see better players and the top professionals in the world today doing is having a swing ratio of three to one. Their backswing is three times slower than their down swing. So what I would do is encourage you to count on your backswing to the number three so one two three and then hit the ball as you say number four. But what’s important is your counting is very constant. So it’s one, two, three, four, you have got the same gap between each number. It doesn’t matter if it becomes one, two, three, four or if it's one, two, three, four. The tempo is constant and both of those different options that I just went through there have the same consistent tempo. So let’s just try that. So we are going to swing the club back, we are going to say one as we start the back swing. We are going to say as we say two we are going to be in a halfway back position. As we say three we are going to be at the top of the backswing and as we say four we are going to hit the golf ball. But what’s important here is that you are not saying the numbers to match where you are in your swing. You are controlling your swing to be in the correct position as you say the number. So work on saying the numbers one and then when you say two you are half way back, when you say three you are at the top of the swing and as you say four you are hitting the golf ball. Okay, the second swing tip that I would give you to help improve your tempo would be to play a game called back hit. This will start to help you get a little pause at the top of the swing; it will help you become a little bit more consistent rather than accelerating too quickly on your down swing. So just allow to your little bit of time just to start to accelerate from a more static position rather than rush the transition at the top. And we see better players in the world look like they've got all the time in the world at the top of the backswing before they start the acceleration which peaks at the bottom of the swing. So with this drill what you’d want to do is as you swing the club back once you reach the top of the backswing position say the word back and then as you strike the ball say the word hits. So we are playing back hits. You say the word back when you are actually at the top of the backswing and you say the word hit as you are striking the golf ball. And if you say that out loud you'll be absolutely amazed with where you think you are hitting the golf ball which is when you are saying hit compared to when you actually hit the golf ball. So again this will really start to help you work on your timing and help on your tempo, work on swinging the club correctly to when you are saying back and when you are saying hit. Get the club tempo correct, get the timing good. The final drill that we could try to work on improving tempo and making it more consistent would be to totally take the speed out of the swing. So I would hit shots initially where we’re making a very, very slow swing. We might only be hitting the ball as a third or a quarter of the way that we could possibly hit it. But we are still making a full swing. So if we cast a full golf swing, as a ten for speed, what we are going to do here is we are just going to drop the speed right off, drop it down to say a three. So we are going to hit golf shots where all we are doing is focusing on keeping the swing speed all the way through, all the way constantly at three. Once you've got used to hitting shots like that you should be seen that you are hitting many golf shots. Good golf shots, a great connection. It’s just not flying as far because the speed is lower. Then move the speed up say to about 5 which is half speed and once you’ve got comfy with that then move the speed up to say a seven or an eight. Now you'll be amazed that once you get back up to seven or eight you are actually hitting the ball as far as you were when you were trying to swing flat out at ten previously. 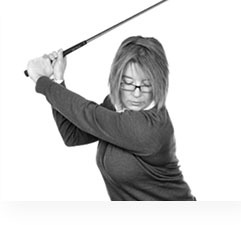 And the main reason for this is because we’ve gotten you focused on your consistency because we are keeping the swing more consistent and the tempo more improved, it will encourage you to get a much better connection, you’ll be getting the ball much more at the middle of the club and generating exactly the same distance just in a more consistent way with a slightly slower swing speed. So work on your tempo, try those three drills and you should find that when you are out on the course and you are under pressure when it really matters, if you can implement one of those three drills it will really help you to hit great golf shots.